The Super Plush Junior is super soft and super plush, making it the perfect towel for the most delicate finishes. The Super Plush Junior Microfiber Towel measures 16 x 16 inches and features an outstanding 75/25 blend of polyester and polyamide. The microfiber�s weight is a hefty 600 g/m�! The tremendous weight of the fabric makes the Super Plush Junior Microfiber Towel very thick and soft. Your hand sinks into the fluffy, silky fibers. 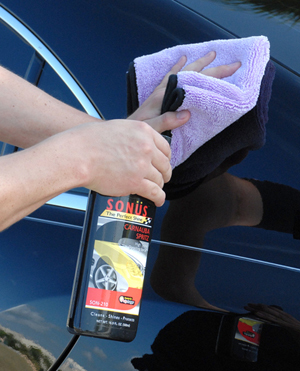 The Super Plush Junior Towel caresses your vehicle�s curves as you buff off waxes, spray waxes, and detailers. The Super Plush Junior Microfiber Towel is perfect for buffing because it has a deep pile where dirt and dust can accumulate away from the paint, rather than being rubbed into the paint. Plus, the long, silky microfibers do an excellent job of massaging away fingerprints and smudges. The Super Plush Junior Microfiber Towel is incredibly soft and gentle on any surface. With microfiber border, a 75/25 blend, and a removable tag, this towel encompasses all the qualities of the perfect all purpose, super soft microfiber towel! Note: Remove the sticker before washing the towel.